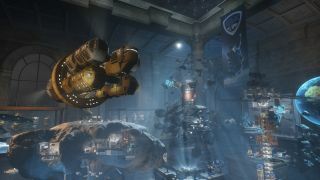 Futuremark, the company behind the 3DMark benchmarking suite, has now released a new one called VRMark for virtual reality. The system requirements for virtual reality games are higher than normal games, and this provides a new independent way to test your PC's performance to make sure it can actually run them before taking the plunge and spending a whole bunch of cash. While a solid 60 frames per second is great for most of the games you play, for virtual reality you'll need at least 90 frames per second. Any less and you're going to start feeling sick in no time. VRMark contains two benchmark tests that run on your monitor and don't require a VR headset (though they can use it if you have one). The Orange Room benchmark tests your PC and reports whether it meets the minimum or the recommended requirements for the Oculus Rift and HTC Vive, the two most popular and resource hungry VR options on the market. After the test completes, along with a score VRMark will explain how your PC fares against VR requirements. The Blue Room benchmark is a more demanding test that aims to show what future VR requirements might entail. It renders at an internal 5K resolution, and Futuremark doesn't expect any current hardware will be able to earn a passing score. Well, maybe super overclocked liquid nitrogen systems, but that's a different story. It's Futuremark's way of seeing if your PC "may even be VR-ready for the next generation of VR headsets." Besides the benchmarking aspect, VRMark can also be in an "Experience Mode" that allows you to look at the quality of the benchmarking scenes with your own eyes. They're set up to allow free movement, spatial audio, and an interactive flashlight so you can look at specific locations of the scene. This will work in VR, or simply on your monitor. VRMark is available now from the Futuremark website or on Steam. There's a Basic edition available for free download, but if you want the Blue Room benchmark and Experience Mode you'll need the paid version. Plus you get to tweak the settings to make the tests more or less demanding. It's normally $20 / £15, but it's 25 percent off for the first week at $15 / £11.